I could post a big long blog post about Eero Vs. Google WiFi Vs. Orbi Vs. Some Other brand that you've never heard of, or a router that looks like a alien spider with a million antennas. But you don't need that, you just need WiFi that works, and that's Eero. It works all the time, every time with every device I've ever tried connecting to any type of router. Their are all kinds of useless facts listed on the front, back and every square inch of every router that you might think mean something if you have a PHD in WiFi but for the most part they are just meaningless numbers and marketing magic to make you feel like your making the right choice. If you want the best WiFi system money can buy that works all the time, every time with every device get an Eero system. So to answer the question what is the best Wifi router to use with nest? It's Eero. But if you want to know why Eero is the best WiFi router system money can buy here it is. We have installed thousands of devices on thousands of different routers and WiFi set ups and we have never had an issue getting a device to connect to an Eero router. The Eero app makes it so easy to set up the router that you can't believe that it is that easy but it is. That's the magic of Eero, there is no logging on to web pages and typing in IP addresses or going through meaningless settings. You just download the app follow the instructions, plug in the router and 3 minutes later your WiFi network is up and running. The Eero base station has pretty good range and I'm sure it's comparable if not better than the other routers on the market but what makes it the best router money can buy is how easy it is to expand a WiFi network. So if you are not getting a strong enough WiFi signal in the corner of the home all you do is buy an Eero beacon and plug it in and like magic your WiFi signal is strong and beaming everywhere across your house. Literally all you do to extend your network is plug in the beacon, click through a screen or two on the app, and your network is extended. It works like technology should, all the time, every time, with every device. 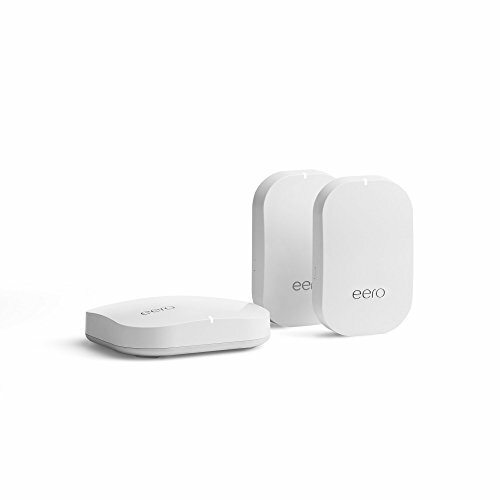 Eero WiFi three pack, with one base station and two Eero beacon WiFi extenders. This is the best WiFi system on the market on 2018. Don't have WiFi in your garage? Just add an Eero beacon in the garage. Don't have WiFi in your basement? Just add an Eero beacon. Don't have WiFi across the street from your house just plug one in your neighbors house. Seriously it's that easy and they are that good. We've installed Eero products all over the place and what amazed us is how good the Eero beacons can repeat and extend a WiFi signal. We literally have placed Eero beacons inside tunnels and just kept adding more beacons along the tunnel and until super fast super strong WiFi was bursting out the other end of the tunnel. No additional wiring required just plug in another Eero beacon and set it up on the app. We've had customers who have lived in solid block and concrete houses built like castles, and when no other WiFi system had worked for them we installed an Eero system and it worked like a charm. We just added Eero becon's wherever the signal was week and super fast WiFi was streaming through your phone no matter where you were in the house. We've had customers who not only live in solid block and concrete castles, but they have fortress like garages and they want to put nest video cameras in to monitor the the things inside their fortresses. Inside the fortress where we were getting almost no WiFi signal we place an Eero beacon and like magic there was super fast internet in the garage and the nest cameras connect and streamed high quality footage straight to their phones to watch their fortress from anywhere in the world. Having seen how well the Eero works in castles, tunnels and fortresses has led me to believe that there is not a better wifi system on the market. The simplicity of how it works and how easy it it to connect Eero beacons to makes it the best WiFi system on the market in 2018. We have had Eeros with over 8 high definition nest IQ 4K cameras connected to the network and it worked flawlessly, with no delays and no downtime. The other thing that sets the Eero apart from the competition is it's app interface. The app is not cluttered with all kinds of settings you don't need to know about, it's clean, user friendly and simple. The app gives you stats on what devices are connected to your network, how much bandwidth they use and their connection status, which is great for troubleshooting if a home automation device is connected to the network. The app also allows you to look at your network from a remote location and troubleshoot your network connection to see if you have an outage from your internet provider. Eero is everything you wished WiFi was but simpler. The Eero system is a "mesh network" so each Eero device communicates with the other Eero devices on the network and they all are capable of repeating the WiFi signal. There is a base station that you connect via hardwire to your modem and then set up the Eero base station through the app. Then if you need to extend your WiFi signal in your home you go to the area that is getting poor coverage and place an Eero beacon there. The Eero beacon plugs into the wall and has a nice form factor that is not disruptive, there are no cords and there is no additional mounting hardware required, you just plug in the Eero beacon and set it up on the app. If the beacon does not connect you move it slightly closer to the main base station until it connects, and then the Eero beacon will repeat the main base station WiFi network signal and extend your coverage to the area of the home that did not have it. You can repeat this process with Eero beacons until every square inch of your home is covered with WiFi and your neighbors home if you want. Eero WiFi Three-pack, our recommendation for the best WiFi system that works with nest in 2018. What is the best wifi network for the nest hello doorbell? What is the best wifi network for the nest thermostat? What is the best wifi network for the nest IQ outdoor camera? What is the best wifi network for the nest outdoor camera? What is the best wifi network for the nest security system? What it the best wifi network for the nest cam? What is the best wifi network for the nest protect smoke / carbon monoxide detectors? What is the best wifi network for the nest x yale lock? What is the best wifi network for the nest indoor camera? What is the best wifi network for the nest thermostat gen e? What is the best wifi network for google home? What is the best wifi network for all nest products?